You’ve been bitten. It all happened so fast, but you’re 99% sure a snake just bit you. The bite size seems to match up to what you’ve seen on television, and you realize you’re now one of the few snake bite victims each year. That’s a scary thought. To make matters worse, you don’t know what type of snake attacked. Snake bite treatment is essential. I’m going to discuss how to treat snake bites, and you’ll learn why medical care and a trip to the emergency room is recommended for most snake bites. If you want to know how to treat snake bites, you must know how to distinguish a snake bite from any other bite. The good news is that it’s near impossible not to know you’ve been bitten by a snake. Some snakes can attach and slither away in less than 2 seconds, but you’ll have more than enough time to know that you’ve been bitten. Snake bites are infrequent, and these slithering pests try their best to avoid humans. 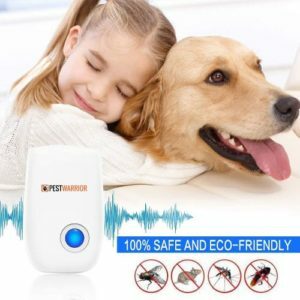 You’ll also be happy to know that just 6 people die from a venomous snake bite in the United States per year, with 7,000 people bitten by a venomous snake. The best bite type to experience. 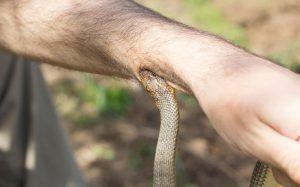 A dry snake bite occurs when no venom is inserted into the victim. And even a venomous snake can choose a dry bite on occasion. 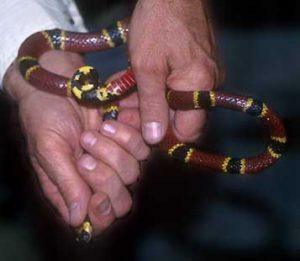 A coral snake, pit vipers and hundreds of other snakes can inject venom or neurotoxins into the victim, causing death, paralysis or serious side effects. 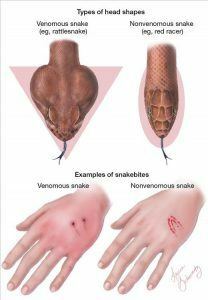 If you know what snakebite symptoms exist and how to identify venomous snakes, you’ll know the steps you need to take to reduce your risk of death from the bite. You’re not a specialist in snake bites, so it’s difficult to ascertain if a bite is venomous or not. Experts recommend that you treat every bite as a venomous bite. There are freak occasions when a person may be bitten through brush, and the snake disappears, slithering away and leaving you in panic and fear. The best you can do under these circumstances is to know the general symptoms of a bite. I want you to take a deep breath and look at the affected area. If you find the area has two puncture wounds, there’s a good chance that you’ve been bitten by a snake. These two punctures signify fangs that have punctured your skin. Redness and swelling around the punctures are common, and localized pain is common. And in any of these circumstances, you’ll want to look up your local emergency number or go to the emergency room now. 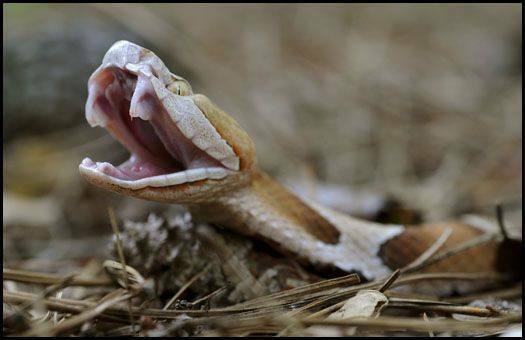 A type of pit viper, the water moccasin, or cottonmouth, has a white lined mouth that looks like cotton. Spanning 50″ to 55″ in length, these snakes are big and found in the southeastern portion of the U.S. near bodies of water. Coral snakes are very beautiful with bands of black, red and yellow, but they’re also highly deadly. These snakes often live underground or like to spend their time under leaf piles, but when they bite, you need to get first aid and medical attention immediately. But when these snakes bite, the snake venom increases slowly, with symptoms only exhibiting after hours have passed. 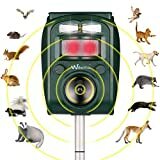 What’s the best first aid for a snake bite? Call 911 (or your local emergency number). Snake bites are great to try and treat on your own, but if it’s a venomous snake, you might die. Maybe. You’ll definitely suffer a lot. Pain will be your best friend. You might fall to the floor not being able to breathe. There’s a chance your heart will stop. You might bleed to death, too. Really, call your local emergency number. Moving will cause the venom to enter deeper into your system and make your symptoms increase dramatically. If the snake is just sitting around mocking you at this point, feel free to snap a picture. 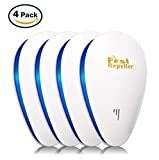 You have a few genius ideas that you believe will really help you before you die from the snake bite you just suffered. After all, you’ve watched a lot of television shows where the person lived because they had some quick thinking skills and took immediate action. You can play doctor another time, but not now. Really. You want to contact 911, your local poison help hotline and even your local poison center. I don’t care who you call, but you need to call anyone that will bring you medical attention immediately. If you allow the venom to spread too far, you may die. If you’re 100% certain that you suffered a non-venomous snake bite, I still want you to seek immediate medical attention. If you’ve been bitten by your pet snake, there’s probably no concern since you know with 100% certainty no venom was exchanged, but otherwise, do the right thing and seek help. You’re bleeding, and a loss of blood is never a good thing. If you lose enough blood, you can die, and if you lose even a small amount, you may feel faint or weak. Stopping the bleeding is the first step of treatment. Using soap and water, clean the bite before trying to stop the bleeding. 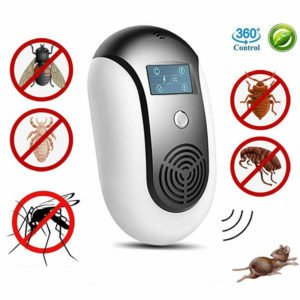 This will remove any foreign substances in the area and help to lower the risk of infection. You’ll want to avoid alcohol-based solutions, as they will burn very badly. But any soap and water will suffice at this time. Better yet, after you’re done with your water and soap cleaning, you’ll want to apply antibiotic ointment to the area to kill any bacteria that may be present. You may have this ointment in your medicine cabinet, or ask a friend or family member to go get some ointment for you. Again, this is just basic first aid, so you’re doing your best to apply antibiotics to the area and stop the risk of infection. Cover the area with a dry bandage. A tight dressing is good because it will slow the blood loss. Note: Keep the area, such as a bitten hand, level or lower than the heart until medical attention is sought. The reason for keeping your wound lower than the heart is to limit the amount of blood with venom flowing into the heart valves and spreading to the rest of your body. What time were you bitten? What did the snake look like? You’ll have to undergo a battery of tests, and this is always the case to find out what type of snake bit you. A general knowledge of the area will also notify professionals as to what type of snake decided to attack, too. Hospitals will stock antivenom drugs if they have venomous snakes in the area. 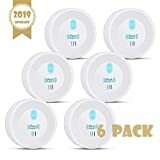 These drugs are powerful and will nullify the reaction to even a neurotoxic snake bite, which is one of the most serious bites you can get. The good news is that prompt medical care will often be enough to ensure that you live. If you wait too long before seeking medical attention and the bite is poisonous, you can die. Pay close attention to the wound to ensure that infection doesn’t set in. If you find that infection does occur, you’ll want to seek medical attention again. Since you’re healing, you’ll want to drink as much fluids as you can. An uptick in water will keep you hydrated and work to speed up the healing process. Try and avoid caffeine for the time being, as you may suffer from heart rate increases already. 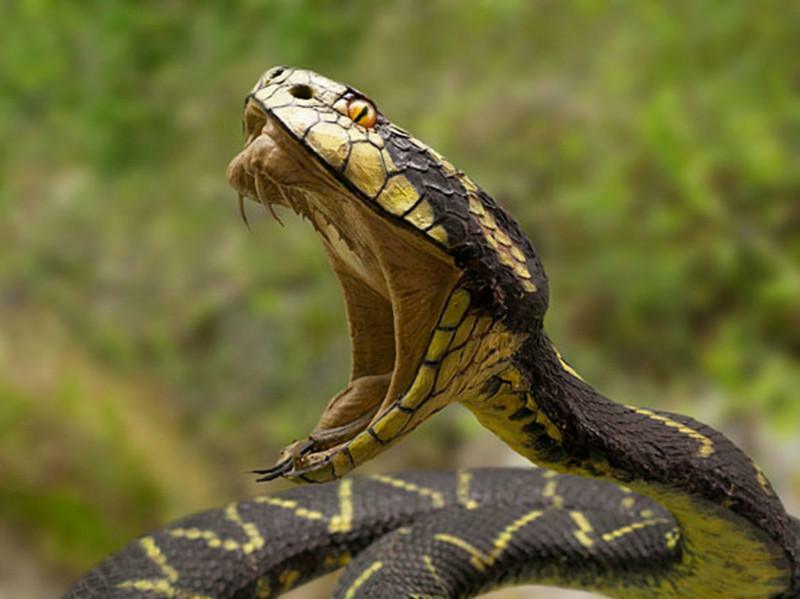 We’ve talked about how to treat snake bites, but now it’s time to fill in the gaps and learn more about these snakes and what they’re truly capable of doing to a human. Some snakes are so venomous, one drop of their venom can kill 100 humans. The first step in understanding snakes and their bites is to learn about venomous snakes. There are lots and lots of venomous snakes, but few people, when considering the world’s population, are ever really bitten by one. Neurotoxins: When a neurotoxin is flushed into your blood stream, this will affect your neurotransmitters. These are the connections of your body to your brain, so you may have difficulty breathing, or you may collapse from paralysis. Cytotoxins: This venom type will cause organ-related symptoms, which can include bleeding and severe pain, too. Myotoxic Venom: A venom that affects the muscles in the body. This can cause pain, and this can lead to muscle and kidney damages, too. Hemotoxic: A hemotoxic bite will destroy the red blood cells in the body and disrupts the body’s natural clotting process. As you can see, all of these bites are very serious. Some people will even experience double vision or go blind from a snake spitting in their eyes. 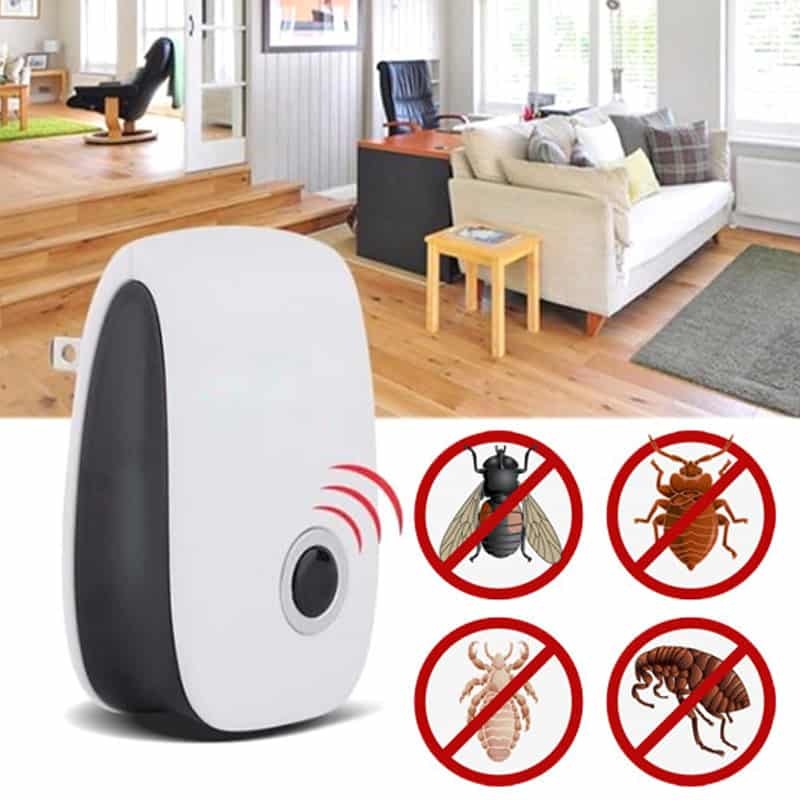 Heart attacks and respiratory failure can also occur. 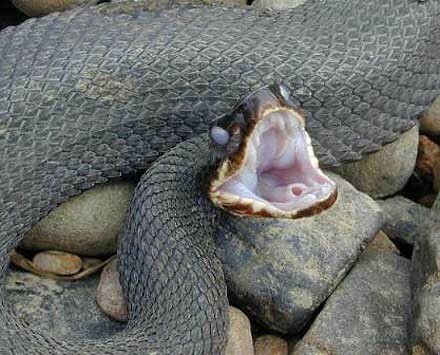 People have fallen into comas, died or started convulsing because of a venomous snake bite. If you’re trying to avoid regions where there are venomous snakes, good luck. 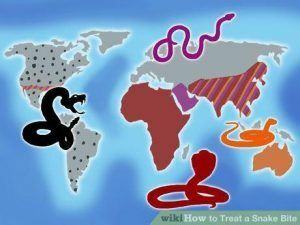 Most continents are home to venomous snakes of some kind, but keep in mind that snakes cannot live in areas where the ground remains frozen all year long. Ireland and New Zealand do not have snakes. Mountain tops where the area is very cold is also snake-free. If you plan on visiting a new region, you’ll need to research the region to find out what venomous snakes live on the land. A dead snake is nothing to worry about, until you realize that the snake is just staying still until it’s ready to attack. You need to understand the behavior of snakes so that you can react to them in the wild. But there are hundreds of snakes with countless subspecies, so it’s difficult to really understand their behavior as a whole. Most snakes want to be left on their own without any interaction. Snakes normally only attack when threatened. Snakes may signal an attack, such as a rattlesnakes rattle. Snakes often bathe on rocks or in the sun – they’re not dead. Many snakes live among leaf piles and under rocks. Snakes aren’t looking for a fight, but when you get too close, you’ll find that a snake might attack out of fear. Unfortunately, even a baby venomous snakes can cause death, so while the snake may look harmless, it can do more damage than the best fighters in the world. Your best bet is avoidance. If you know you’re going to be in an area overrun with snakes, you can wear snake-proof boots and gear to limit the risk of being bitten. Thicker material works best, as the snake’s fangs won’t be able to pierce through the material. 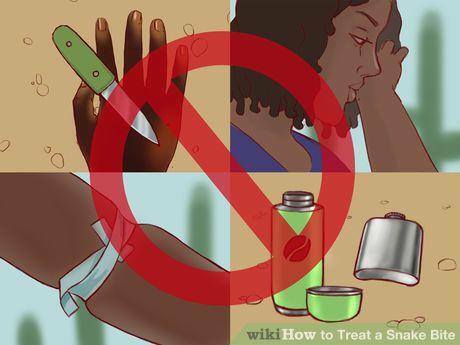 If you’re sure you’ve been bitten by a snake and want to know how to treat snake bites, your best bet is to always seek medical attention. Clean and wrap the wound as stated above, but before you do, you may want to look for a snakebite kit. These kits may work, but some doctors state they do more harm than good. 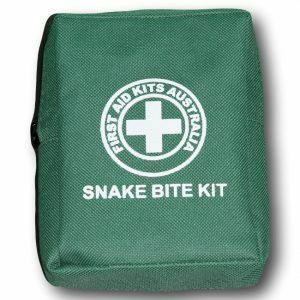 Of course, you can buy a snake bite kit and use it, too. These kits will often include everything you need to properly dress the wound. I always recommend calling for emergency help as soon as possible because snake bites can be deadly. In fact, when a snake can kill an elephant with a drop of venom, you know it’s able to kill even the strongest human on the planet. If you’re looking for a reputable snakebite kit, we discuss a few of the most common and recommended kits in our article: 7 Affordable and Easy-to-Use Snake Traps That Work.